Easy peasy new quilt pattern and a new look! Good morning, and happy Friday to you! If you're reading this morning over in Bloglovin' or Feedly or something like that, please take a moment and pop on over to the real blog - I've just finished going through a major blog makeover, thanks to the help of super blog designer Noor Alquanti. I highly recommend her if you're looking to spruce up your blog. I'm really happy with everything she put together, and I think the blog practically sparkles now, with all the beautiful white space, not to mention the great new logo. I'd love to hear what you think of the new look! I've also got an easy peasy new free quilt pattern to share with you today, using some old stash favorites as well as some great prints from Modern Yardage. 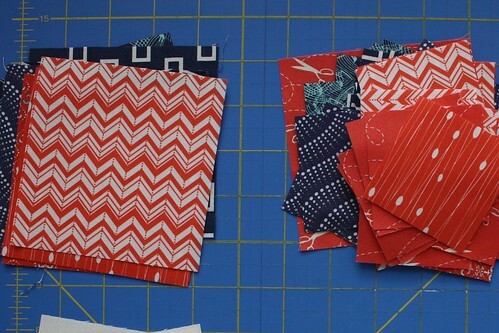 I fell in love with a fun deconstructed chevron that Heather Dutton designed for them, and found a few other prints of hers that I enjoyed, then pulled some stash basics to round out my selection. Then I pondered what to make. And pondered some more. And then I moved, and well, everything went to pot, so to speak! 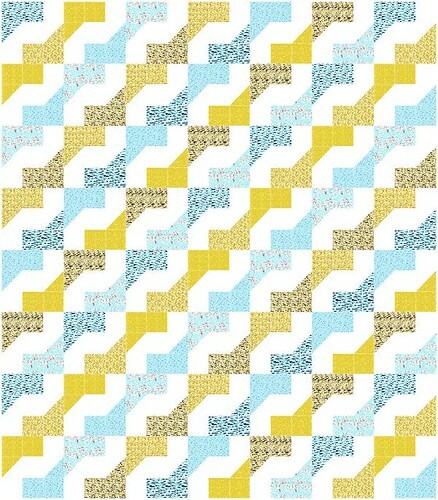 Introducing....the Easy Peasy Faux Zig Zag quilt pattern! A free pattern download, available right here on Craftsy. The pattern includes four quilt sizes: mini (like mine), baby, throw, and queen size, with all of the information you've come to expect from my patterns. And this is seriously an easy quilt to put together - you can easily put one of these together in a day or even a weekend, if you're working on the queen size.